REVIEW: This is a novella. You can read it in a night. But it punches well above its weight. A Meal in Winter, I am told, will be published as a gorgeous little hardcover but I read the proof, a very drab looking proof is was too, and for some reason, even before I read a page, I had the notion that this was a rediscovered work, much like the work of Irène Némirovsky. To further compound my assumption, as I read, I was reminded of Primo Levi, of Beckett, of Camus. But this is not a rediscovered work. 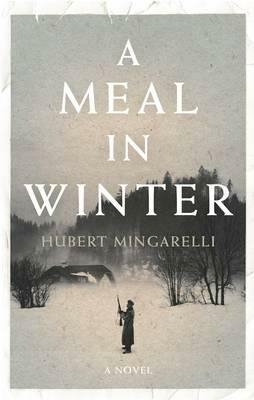 Though it is set in WWII and reads like it was written during or shortly after the war, A Meal in Winter was written in the last few years and is now available in English having been translated from the French. And this fact alone would make it an astonishing work. But this is just the start. In 144 pages, author Hubert Mingarelli strips the Second World War down so that it stands before us shivering in its underwear. And what is surprising, even though he has reduced something so unimaginably huge and complicated into something so small and finely wrought, he manages to avoid trivialising the horrors of that awful period by his reduction. We accompany three German soldiers as they journey out into the sub-zero Polish winter in search of fugitive Jews. We are privy to their conversation. We take part in their attempts to remain alive, and sane. We are forced to accept their humanity. And because of this, when they do manage to capture a hiding Jew, we are brought uncomfortably close to a truth we all try hard to avoid.